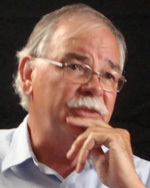 Mike Jacobs has been editor of the Grand Forks Herald since 1984 and editor and publisher since 2004. He grew up milking cows near Stanley, N.D., was graduated from the University of North Dakota and has worked as a farm laborer and a bar tender. His career in newspapers includes stops in Dickinson, Mandan and Fargo, N.D. The Herald won the Pulitzer Prize for Public Service after the Red River flood of 1997. Jacobs was named editor of the year and won ASNE’s distinguished writing award for his flood-related editorials. Mike Jacobs, editor & publisher, The Grand Forks Herald, says the newspaper was started in 1879 by George B. Winship, an itinerate printer and entrepreneur. The Bacon family owned the paper for 40 years, it was briefly employee owned, and then the Ridder brothers, who subsequently became Knight-Ridder, purchased it. McClatchy purchased the Knight-Ridder chain in 2006, and quickly sold The Herald to Forum Communications, Fargo, N.D., a privately held regional communications company. In 1997, The Red River flooded Grand Forks and shut down The Herald, which subsequently caught fire and burned. Through the flood and fire, the newspaper continued publishing, and, in 1998, it was awarded a Pulitzer Prize for Public Service. Mike Jacobs tells the story of the newspaper and some of its colorful editors.